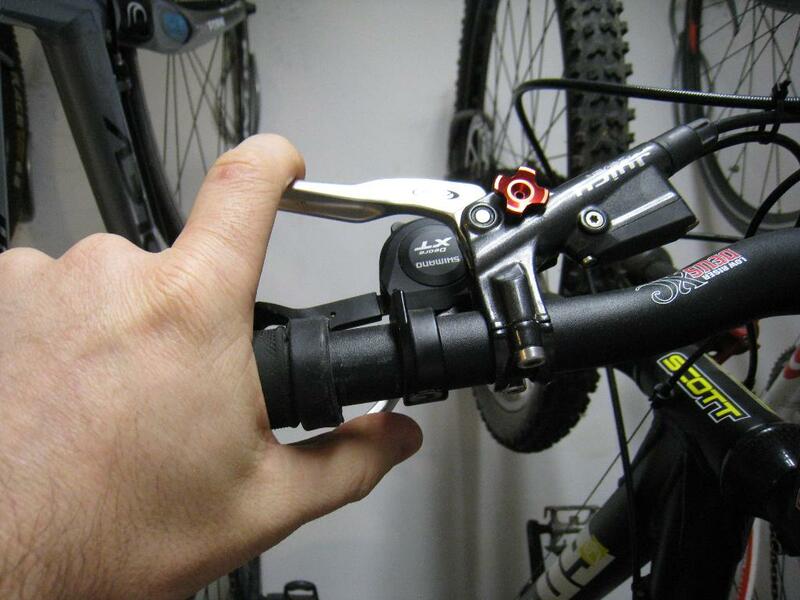 I want to run my shifters inside my brakes so I can pull the lever with my index finger. I'm running LX shifters right now, will those work? I know I have to take the display off, but do they have a plate to replace it? I don't want to leave it open. Also I'm not sure these will work even with the display removed. The shifting mech still looks like it's in the way. Has anyone else used this set up with these shifters or similar? I have no issues pulling the release lever with my index finger and my shifters are outboard of the brake as usual. The usual setup is grip than brake lever than shifter (moving from the outside in on the handlebar). Is that how yours is setup? I don't understand. This is the normal setup in the picture. What are you trying to do? With the normal setup you can easily reach the release lever with your index finger. No, you explained it fine. You can do that, I did it with my juicy 7's and XT shifters. You can remove the indicators (at least on the XT's you can) and the shifters will work fine. You may have to rotate the shifter slightly downward to make it fit, but I know several people that do it. It doesn't hurt to try it. I placed mine in the same position so that my index finger was at the very end of the brake lever for maximum power under one finger braking. Last edited by civil; 11-25-2009 at 08:57 PM. Yes, you guys got it. That is exactly what I was looking for. I guess they don't make a cover to replace the display. I think I'll give it a try if it ever stops raining. Rain makes for a good ride. It appears you have the answer you were after, but just to confirm, I was trying to do the same thing as you. I found that SLX and XT had a removable gear indicator and cover, but LX and below do not. I changed over to X9 for this reason. You will find with the LX shifters that you will either have to put the brake lever too far inboard to clear the gear indicator or turn the shifter on the bars a long way so that the gear indicator goes under the brake lever. Either way it will not be comfortable. Your shifters are inboard of the brake. Inboard means towards the center of the bike. OP - I've covered those shifter indicator openings with a small piece of duct tape, stayed in place just fine. 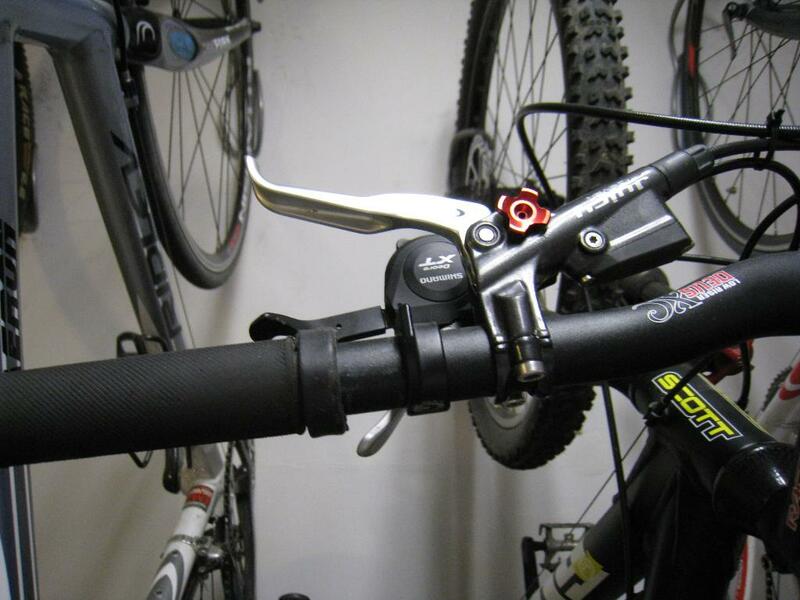 For cable actuated brakes or poor hydros where you need to grab a handful to get them to work, then I would agree that grip/brake/shifter is fairly standard/necessary; but for decent, one-finger hydraulic brakes, grip/shifter/brake is the norm. My brake clamp is about 5cm inboard from my shifter, with the tip of the lever blade about 3.5cm inboard from the center of my grip. I've started using my middle finger rather than my index finger for braking. This way you can still run your brake levers outboard of your shifters and your middle finger will be toward the end of the lever. It was kinda weird to get used at first, but now works really good for me. I only ride bikes to fill the time when I'm not skiing. Do you find that having to rotate the shifter downward makes the angle awkward or less optimal than having it on the other side? Those only work with Sram X0 or X9 shifters, so he would need to dump his LX shifters and rear derailleur just to use those. His brakes also have to be Matchmaker compatible also. Since he is running XT 775's he would also have to get a set of Avid brakes. A little expensive in the long run to run the Matchmaker setup. Yeah, so I'm not going to do it. First of all, I just got those 775's and they kick my old juicy 5's in the nuts. Second, I'm running a shadow RD because I like to smash RD's into things. So I'm not going to go sram. I could go xtr, but I'm not ready to get new shifters. The LX work fine right now. For me, having it on the other side won't work. I don't like having my index finger that far inboard on the lever. The amount I had to rotate the shifter was very small. I didn't feel a difference. Call me weird but how does having a shadow rear derailleur help you from bashing rear derailleurs? Shadow RD are only slightly different from a traditional RD. You're weird. It doesn't stick out nearly as far as a regular der. If you ride in the rocks, it's less likely that you'll clip it. Doesn't always take a big difference to be effective. I thought I was the only one doing that! I use my middle and 4th finger for braking and leave my pinky finger flying free off the bars. Pinky kind of looks like a snooty tea drinker holding a cup. The shadow RD doesn't stick out past the skewer. I have not smashed this one in over a year (that is a long time for me), but i have noticed the skewer has a good amount of scratches and dents, so it must be working. Plus it shifts really nice, an unexpected bonus. I didn't know that. I don't think in my riding experience i have ever brushed my RD on anything.